The Economic Development Commission will provide leadership, education, and the tools necessary for the Golden community to optimize appropriate economic opportunities. Golden will be a prosperous, sustainable community generating the best possible quality of life for its citizens. A community that includes high quality job opportunities, diverse housing, advanced transportation, superior educational opportunities, state-of-the-art infrastructure, natural environment protection, productive commercial and civic entities, fiscal health, cultural and recreational amenities, and preservation of its historic character. Golden will exhibit, in its policies and programs, consideration for future generations and recognition of the interdependence of its economy, social fabric, and environment. The Economic Development Commission (EDComm) was established by Golden City Council in June of 1999. After applications were accepted for appointment to the Commission, candidates were interviewed by City Council and eight members were appointed in August of 1999. Each member has a broad base of professional and complementary expertise in the fields of finance, advertising, retail, and economic development. The Commission’s duties include developing a structure and strategy for marketing/promoting the Golden community. Membership is for staggered four year terms. 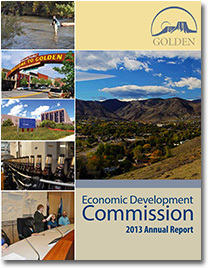 The Economic Development Commission 2013 Annual Report is available for download in pdf format by clicking the Annual Report image to the right. For more information about economic development efforts or current programs, please visit our Economic Development page. Any questions related to the work of the Economic Development Commission should be directed to Steve Glueck, Community & Economic Development Director at 303-384-8095. The Economic Development Commission meets regularly on the second Tuesday of each month starting at 6:30 p.m. in Council Chambers located at 911 10th Street. If a meeting must be rescheduled for some reason, the date will be noted on the Community Calendar. To view archived agendas and minutes from meetings prior to May 2015, please visit our Document Center.